About the cover: Cerebral cavernous malformations (CCM) are vascular lesions causing seizure and stroke. Mutations in one of three genes, ccm1, ccm2, or ccm3, cause an increase in RhoA expression and activation. Increased RhoA and Rho kinase activity inhibits endothelial cell vessel-like tube formation. A small molecule inhibitor of Rho kinase rescues the CCM endothelial cell phenotype, defining Rho kinase as a therapeutic target to rescue endothelial cells from loss of CCM protein function. 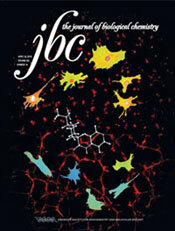 For details see the article by Borikova et al., pages 11760–11764 (online at JBC). For a more complete listing of publications click on the pubmed link below.